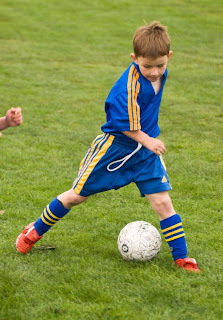 My oldest boy Dash, is absolutely bonkers about soccer - actually any kind of sport. 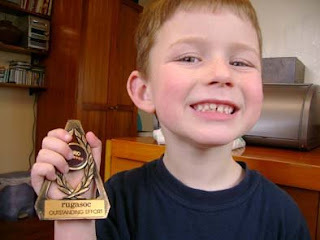 He has been in a soccer skills club since he was three and this year is his first year playing for a club. I was never the sporty type and I used to imagine that the sports side of things would be left up to the kids' sporty dad - but I have to say that I love watching Dash's games, even if it means being out of the house on a cold winter's morning at 7.30am - on a Saturday! From the minute Dash wakes up he is in soccer mode, kicking a ball up and down the hall. Ask him what he wants to do when he grows up and he says "play soccer for England". Mr G is English, from Newcastle, and Grandma sends over soccer "strips" (team uniforms) for Newcastle United and the English team. It's hard to get him to wear anything else - I've given up trying to stop him wearing shorts all winter. Dash knows all the players' names; he watches soccer DVDs and copies the players' moves. Not only soccer but he also loves rugby - he collects rugby cards (from the Weetbix, not the chip packets!) and knows all the players names, their numbers and what position they play. He cried when the All Blacks lost against France (who didn't??) and refused to let me watch South Africa getting the trophy after they had beaten England in the world cup. He kept trying to turn the telly off!! Did I mention he is only 5?? 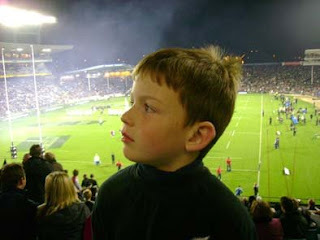 Recently when the All Blacks played England at Eden Park, I thought it would be a great thing for him to go with his dad. When would he get a chance to see them play each other again live - not for another four years! Mr G wasn't so sure, as it would be a pretty late night and would he hack it? He got two tickets, planning to take a client, but it fell through. "Come on, take Dash!" I urged him. So he did; and didn't they have a blast?! All rugged up in their Black gear they caught the train to the stadium. Mr G says he felt so proud walking along with his boy; the atmosphere was amazing, the game was great... Dash didn't stop talking about it for weeks. I encourage you mummies, sometimes we see things that the daddies don't. Mr G is so glad he listened to me and took Dash. It was a night Dash will always remember; it was great "male bonding", which is so important for little boys. I am a firm believer in not overscheduling the kids' time. They need time to play with friends and just relax at home as well. My plan is "one thing each" - Dash has his soccer, Princess does gymnastics (which is so her). I reckon if we nurture our kids' interest, it can become a life-long passion. Who knows where it will take them? How amazing that he is so passionate about it!! He has so grown up since we saw you last!